In these economic times, most people are having to pay a lot more attention to budgeting than they are used to. One of the biggest expense for most families is grocery shopping. Grocery shopping is one of the easiest expenses to spend to much on if you are not keeping careful track of it. If you want to reduce your grocery bill it is going to take careful planning to avoid spending money on items that you don’t really need. One of the best ways to keep track of what you really need to buy to avoid buying things you don’t is by using an Excel grocery list template. If you want to start saving money on groceries it would be a good idea to design a meal plan for your home. 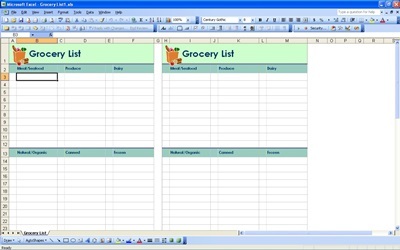 When you plan out your meals ahead of time you will know exactly what ingredients you will need and you can record them on your Excel grocery list template. You can then print out your grocery list and take it to the store with you. Having the list will assure that you get everything you do need, and help prevent you spending money on things that you don’t. With an Excel list you can even design a few months ahead of time, and alter your lists when you need to. You can also add extra areas to keep notes, like which store carries what products at the best price. Since you will have a record of everything you bought at the store, you can go back over them to see if there is anything your buying too much of or that you don’t need so you can start saving some money that way. Many people find that using an Excel grocery template allows them to have more self control at the grocery store and better avoid impulse purchases.